An indie side-scrolling platformer game created by a Japanese artist and programmer known as Pixel (Amaya Daisuke). Notable for its single-handed creation, its unique story, and innovative yet nostalgic gameplay. 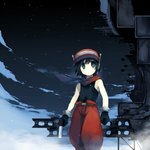 It was produced for Windows; an independent team of translators offered a localization in English, titled "Cave Story". The player controls an amnesiac robot named Quote who decides to help a resistance effort by the rabbit-like Mimiga and their human compatriots, a team of scientists. The team's doctor came across a powerful artifact called the Demon Crown, granting him the power of a sealed evil, and the allegiance of Misery, the crown's creator, and her associate Balrog. The game was officially released in English as a Wii WiiWare game. While it costs 1200 Nintendo Points, the WiiWare version came with several modes the original did not possess, such as the abilty to play as fan-favorite, Curly Brace. This version was later sold as DSiWare as well. It has gotten a full-scale remake on the Nintendo 3DS. The following tags are aliased to this tag: cave_story (learn more).